Uncanny Magazine is recruiting new members for its Space Unicorn Ranger Corps! We named the Uncanny Kickstarter backers the Space Unicorn Ranger Corps after our amazing Space Unicorn mascot. Now, you can become a member of the Corps by subscribing at Weightless Books! This is the perfect time to join because Uncanny is going on sale! 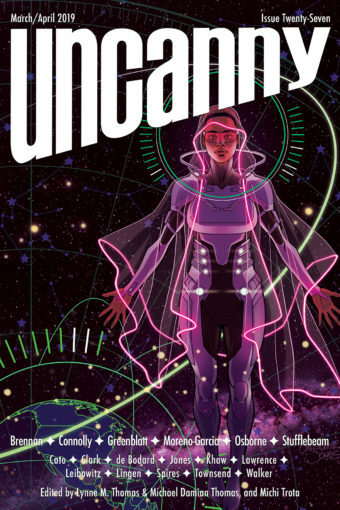 From May 5-19, a year’s subscription to Uncanny Magazine is $2 less than the typical current cover price (only $21.88)! It’s the least expensive way to subscribe we’ve ever offered. Each bimonthly issue of Uncanny contains new and classic speculative fiction, poetry, essays, art, and interviews. We seek out and share pieces we can’t stop thinking and talking about, because of how they make us feel. We’re also deeply committed to finding and showcasing fantastic works by writers from every possible point of view and background. We debuted Issue One of Uncanny in November 2014 and we’re thrilled with Year One. We’ve included contributions from phenomenal authors such as Neil Gaiman, Jim C. Hines, Maria Dahvana Headley, Max Gladstone, Ken Liu, Christopher Barzak, Sam J. Miller, Sofia Samatar, Sarah Pinsker, Catherynne M. Valente, Elizabeth Bear, John Chu, Kameron Hurley, and Amal El-Mohtar, plus many newer voices. We can’t wait for you to read what’s coming next. New or renewing subscribers to Uncanny Magazine from May 5-19, 2015 will be eligible for giveaways and a whole bunch of Uncanny swag! When we reach a total of 50 new/renewing subscribers we’ll unlock an ebook of Issue One for *every* new/renewing subscriber. Plus, we’ll randomly draw 2 winners for Uncanny swag packs: postcards, a sticker, and a Space Unicorn Ranger Corps patch! At 100 new/renewing subscribers, every new subscriber will receive an ebook of Issue One and Two. Plus, we’ll draw for a set of signed cover-art posters and a Space Unicorn Ranger Corps patch! At 150 new/renewing subscribers, all new/renewing subscribers will receive ebooks of Issue One, Two, and Three (all caught up! ), and we’ll draw 2 winners for signed books: The Republic of Thieves MMPB by Scott Lynch and Karen Memoryhardcover by Elizabeth Bear, plus a Space Unicorn Ranger Corps patch for each winner! At 200 new/renewing subscribers, we’ll draw for a mega-swag pack that includes postcards, a sticker, a patch, signed cover art, and both signed books! At 300 new/renewing subscribers, we’ll draw for a Samsung Galaxy Tab 4 7.0″ Android tablet, a Space Unicorn Ranger Corps patch, and a sticker! There may also be random prize drawings throughout the subscription drive. You never know with the Space Unicorns . . .